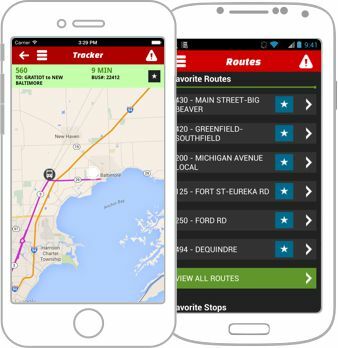 Download the RideSMARTBus app for Android and iPhones. Get quick access to real time arrival, routes and schedules and service bulletins. Our mobile app is easy to use and puts important information such as routes, schedules and bus tracker at the rider’s fingertips. After creating a MySMART account and logging in, riders will receive instant access to all of their favorite bus routes and stops. These favorite routes will then appear on the home screen. Use this tool to get a listing of SMART bus routes and published times. This feature allows you to get the realtime bus arrival information for your stop. By becoming a MySMART member, quickly access all of your favorite bus routes and stops that you use most often. See the SMART stop nearest to you when you enter an address, a street intersection, or a landmark (such as the Royal Oak Transit Center). What's the best trip for me? If you know where your trip begins, where you need to go, and what time you need to travel, this is the tool for you. Get detailed information about your best route options. When service changes or issues occur, it is nice to have a message waiting for you. If a bus is detoured or bad weather hits, the ride SMART Bus app will send you service bulletin notifications to keep you up to date.